The team of researchers has successfully 'trained' a respiratory virus to recognise ovarian cancer and completely destroy it without infecting other cells. The reprogrammed virus could also be used to treat other cancers such as breast, pancreatic, lung and oral. Dr. Alan Parker from Cardiff University's School of Medicine said: "Reprogrammed viruses are already being used in gene therapy procedures to treat a range of diseases, demonstrating they can be trained from being life-threatening into potentially lifesaving agents. "In cancer treatment, up until now, reprogramed viruses have not been able to selectively recognise only the cancer cells and would also infect healthy cells, resulting in unwanted side effects. "We've taken a common, well-studied virus and completely redesigned it so that it can no longer attach to non-cancerous cells but instead seeks out a specific marker protein called αvβ6 integrin, which is unique to certain cancer cells, allowing it to invade them. "In this case we introduced the reprogrammed virus to ovarian cancer which it successfully identified and destroyed. 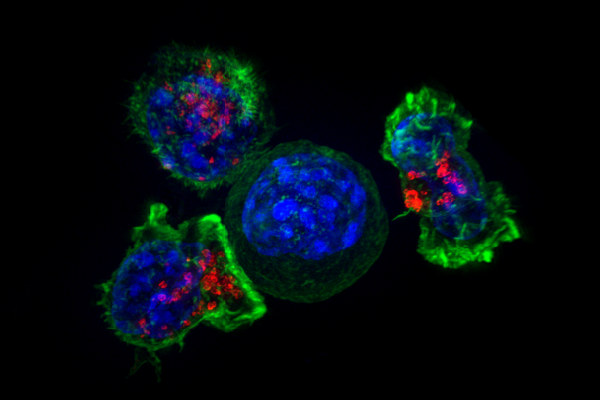 "This is an exciting advance, offering real potential for patients with a variety of cancers." Once the virus enters the cancer cell it uses the cell's machinery to replicate, producing many thousands of copies of itself, prior to bursting the cell and thereby destroying it in the process. The newly released viral copies can then bind and infect neighbouring cancer cells and repeat the same cycle, eventually removing the tumour mass altogether. The virus also activates the body's natural immune system, helping it to recognise and destroy the malignant cells. The research was carried out in a laboratory, using mice with ovarian cancer, and has not yet reached clinical trials. The next step is to test the technique with other cancers, with a view to starting clinical trials in five years' time. Dr. Catherine Pickworth from Cancer Research UK said: "It's encouraging to see that this virus, which has been modified to recognise markers on cancer cells, has the ability to infect and kill ovarian cancer cells in the lab. Viruses are nature's nanotechnology and harnessing their ability to hijack cells is an area of growing interest in cancer research. The next step will be more research to see if this could be a safe and effective strategy to use in people." The paper "Ad5NULL-A20 – a tropism-modified, αvβ6 integrin-selective oncolytic adenovirus for epithelial ovarian cancer therapies" is published in Clinical Cancer Research.